Over the past two decades, and with the furthering of social media, our business environment has evolved into one in which the relationships between companies and their customers are becoming more open and interlinked. With the acceleration of changes in technology that advance our capability to communicate and create a broader array of customer and user experience, the application of design has also accelerated. As a result, the true market leaders in the design of the most innovative customer experiences are creating a context in which customers are becoming active members in the design of the very products and services that they are buying. More and more, customers get to influence how products and services are created, branded, sold, and delivered. With these shifts, comes a new set of requirements for organizations, their leaders, and the people in them to better understand the motivations of their customers. They must better understand the customer desires for attention, competency and caring and how to engage in their delivery through brand experience. To attain success, more open systems and engaging means of participation are required. Ultimately, this requires the application of design thinking to engage the customer in a manner that aligns their experience with the brand intention. How we have used design thinking has changed rapidly and we now find ourselves responding to a new way of experiencing our world. More and more, we are questioning how and why we interact with one another in the way we do. We question intention and purpose, what our motivations are, and whether those align with the intention and purpose of the organizations we buy from. For this reason, we recognize that to be successful, the providers of products and services need to engage and align with their customers at more emotional levels and with greater consciousness of what they are seeking and why they are seeking it. If we add to this need for greater awareness to the development of our capacity to innovate, the way in which we participate with one another will continue to expand and change. The shift to improved transparency also requires us to more consciously design and develop the cultures and learning capacities of our organizations that actually include and give attention to both external and internal customers. The evolution of design that has unfolded over the past century is likely best explained by Richard Buchanan’s Four Orders of Design. Buchanan, a professor of design, management, and information systems, suggests that as an organization matures in its use of design. It tends to move from visual design and graphic communication to industrial design and products, then to brands and interactions, and then, finally, to systems. Buchanan summarized in the Fourth Order that attention shifts to the design of systems in which people interact with one another, including businesses, organizations, education, and governments. A great way to define design thinking organizations is to see them as learning organizations, using design thinking to increase understanding of real problems, of customers, of obstacles, of options, of knowledge, and of one another. In effect, by using design thinking to empower creativity and collective imagination, organizations develop the means to step further toward what lies at the core of human-centered experiences – our basic human needs and motivation. By adding the customer to the mix, one can readily experience the power that comes with it. Powered by design thinking at scale, a new level of awareness is enabled. Design thinking actually is the creation of awareness and the sharing of knowledge. Design thinking provides a methodology that both naturally and intentionally leverages the collective imagination and transforms the cultures of organizations into being more innovative. Along with providing the means for cultural transformation, it also provides organizations with the opportunity to step into the Fifth Order of Design – Awareness. In doing so, as part of the process, companies are able to engage customers in such a way that they become more aware of their own personal experience. Furthermore, as a key ingredient to their involvement, they are able to discover and better understand how and why they are motivated as customers. 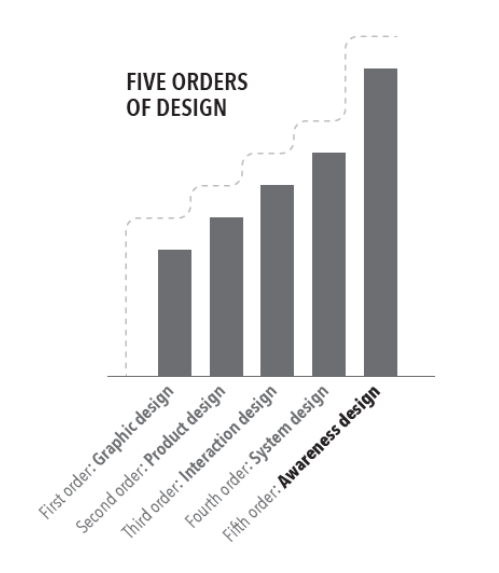 By applying the Fifth Order of Awareness Design, along with setting the stage for designing the intentional interaction of people, we move from the intellectual exercise of product and service design to the emotional aspects of human behavior. This involves a keen understanding of who and why, resulting in the creative expression of how. What better way to discover new possibilities than through inviting the customer to explore their awareness of their own motivation and desire? They’re asked to integrate that learning into the design of a product or service and their ideal experience. Where does the Fifth Order eventually take us? As we tap further into human motivation and create the context for increased customer awareness, we improve the probability that, as customers, we will elevate and expand the role and value of emotional intelligence. As a result and consequence of increasing consciousness, we will escalate our expectations for how products and services more directly respond to and fulfill our desires and needs. We will become, almost certainly, more demanding and want to play a more integral part in the design of what we wish to buy and expect even more transparency of how it happens. Needless to say, the Fifth Order provides a bounty of opportunity, much of which will come to light as we unfold its potential and creatively expand its application. From the broadened development of design thinking processes that further engage customers, to the application of design awareness, to AI and new technologies for immediate customer and user responsiveness, and to its use in tackling wicked problems, Awareness Design may likely be the most powerful aspect of design imaginable. If not, it will very likely be a powerful step towards finding it.